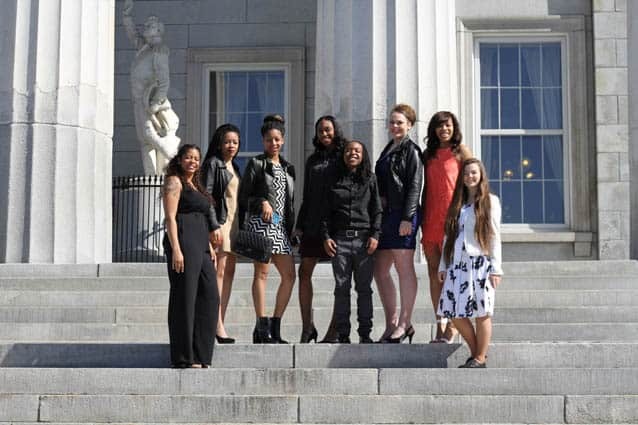 The CSJ women’s basketball team stands on the state capitol building steps in Montpelier on April 15. The State of Vermont introduced a joint resolution to congratulate the College of St. Joseph women’s basketball team on winning the 2016 United States Collegiate Athletic Association D-II National Championship. The honor was officially presented at the state capitol building on April 15. Rep. Thomas Terenzini addressed the House and members of the community in the gallery, expressing pride in the team’s hard work, perseverance, and close bond with one another. “Although perhaps not as well-known as other Vermont college athletic teams, the 2016 College of St. Joseph Lady Saints women’s basketball squad recently completed a memorable season and this talented group of basketball players surmounted nearly every obstacle it encountered and defeated all its opponents, other than an NCAA Division I team, concluding with an amazing 31-1 record,” the resolution read. The team took home the United States Collegiate Athletic Association D-II National Championship in March, becoming the first team in the state to win a national title in basketball. The Lady Saints also earned their second straight Yankee Small College Conference championship in 2016. The women had a near-perfect 31-1 overall record, with their only loss coming from NJIT, an NCAA Division I team. The National Championship game marked their 29th consecutive win. All eight members from the team, including four seniors, were present for the reading of the resolution, including Shamari Brodhead, Chontayvia Kennedy, Arreonte Anderson, Regina Steele, Jazsala Laracuente, Nia Gilchrist, Elizabeth Turco and Kelly Festa. The resolution also recognized Head Coach Chris Wood and Assistant Coach Ebony Jones, who was also on-hand to support her team. The Lady Saints were presented with copies of the resolution and posed for pictures with members of the Legislature.